The Item List displays a list from which dialog forms can be launched that allow supplementary items to be specified. The dialogs to launch and the information on the dialog forms that is to be passed into the item list control are set by the Items property. 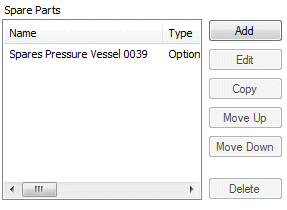 Using a dialog form, Item Lists will take values selected from this form and add them into an Item List control. A user form control that allows items to be added to the specification.